I’ve struggled with my weight since I can remember and was always the chubby kid. As a teenager, I became very active in cheerleading and softball, but in order to do those things I had to be “skinny.” At the age of 13, I developed an eating disorder and my struggle with food addiction continued. Only after joining the Army at 19 did I realize the importance of exercise and healthy eating. Unfortunately, it didn’t last and my lifelong battle with food addiction eventually won. After serving two years in the Army, I married and had three children. My weight continued to fluctuate and I took every diet pill and tried every diet in order to become “skinny” again. I starved, binged, and purged for the next 13 years. In September 2009, I decided to have the Lapband and was able to lose 110 lbs—maintaining my goal weight for three years. A major setback occurred and my doctor decided it must come out. I was devastated and fell into depression which led to the regain of 100 lbs. On November 30, 2016, I made the decision to have gastric bypass and it changed my life. I work daily to achieve a realistic weight by following a low carb, no sugar, and very high protein diet. I drink water—lots of water— throughout the day. I don’t take any medications and feel better than I have in years. I take my vitamins religiously and have blood work done every six months to ensure my blood levels stable. I no longer live in fear of diabetes, high blood pressure, or heart disease. I’m a member of an online support groups which encourage me greatly. We share our experiences, get feedback, and strengthen each other. 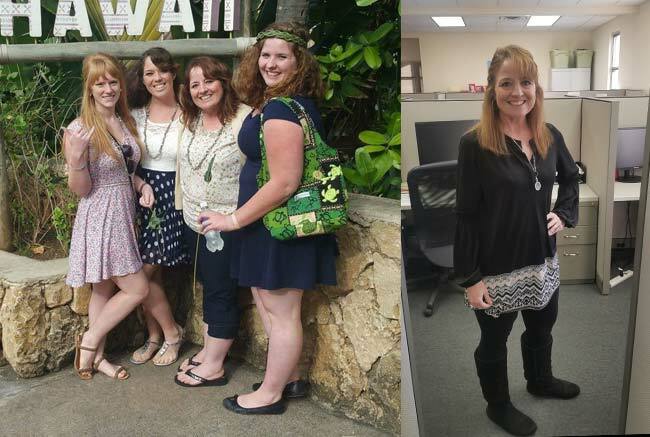 My before picture is one I took in Hawaii at my heaviest with my beautiful daughters. Behind the smile is misery, knowing how heavy I’d become and not wanting my picture to be posted on social media. My after picture was taken today, feeling confident and happy in my skin. Conscious eating + exercise I enjoy = success. I’ve learned through this wonderful, but sometimes challenging experience, that health and happiness is a daily choice. It’s not a destination, but a journey. Dr. Sanborn and his staff have been exceptional through this process. I remember the day of surgery, Dr. Sanborn asked me what I wanted most out of this surgery. My response was that I didn’t want to be sick. I’m 1 year and 3 months post op feel better than I ever!